Canada’s leading firms raised their combined research spending to $12.5 billion in fiscal 2013. And with a $20.4 million R&D spend last year, Resolute was counted among these innovative companies. “Being a part of this list is an important endorsement of Resolute’s ongoing work to drive innovation in the forest products industry,” said Seth Kursman, Vice President, Corporate Communications, Sustainability and Government Affairs. 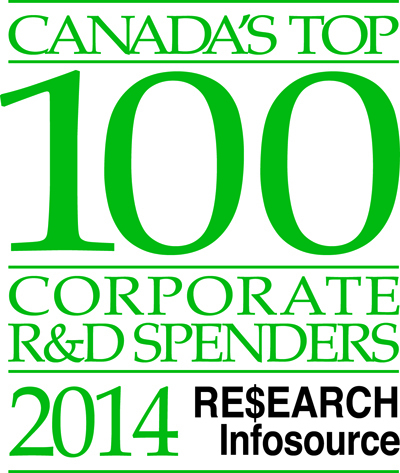 Resolute ranked 69th on the Canada’s Top 100 Corporate R&D Spenders list, which was released November 3rd. We moved up from our 2012 standing at 87th due to an increase in our research spending – 23.4% more than in our previous year. The list is compiled annually by Research Infosource Inc., a resource for R&D intelligence and publisher of Canada’s Innovation Leaders, a national print vehicle that highlights the country’s most innovative universities, corporations, hospitals and colleges. Why is R&D spending important? Spending on R&D is an important indicator of future competitiveness, said Ron Freedman, CEO of Research Infosource, the firm that compiles the list. In an interview with the Waterloo Record, Freedman explained that research and development spending is the tool companies use to create the jobs of tomorrow. What R&D are we doing? Resolute’s research projects of late have focused on the commercialization of innovative products like biochemicals, bioenergy and biomaterials. And we are also evaluating opportunities to diversify into renewable energy products. Commercial applications for cellulose filaments: In June, we launched Performance BioFilaments, a venture jointly owned with Mercer International Inc. to develop commercial applications for cellulose filaments, which can be used in aviation, marine, aerospace, electronics, manufacturing and construction sectors, as well as in paint and consumer products. Biofuel production technologies: We are leveraging our strategic expertise in responsible forest harvesting and access to forest biomass to investigate various technologies that could potentially commercially produce biofuels. Pulp and paper process optimization: We are focused on reducing waste and increasing efficiency in our manufacturing processes, while efficiently managing and increasing the value of by-products, including remanufacturing production waste into biochemical and biomaterial products.